You wait at the bus stop with a bunch of other people. No line. Sometimes the bus stop is really crowded, sometimes it’s not. You never really know when your bus is going to come because there isn’t a schedule. Apparently you can text some number to find out when the next bus will be coming, but I never figured that out. It seemed too complicated, and they didn’t have the instructions at the bus stop. When your bus finally comes after some amount of time, all of the people will approach the door at once, and at best it’s awkward as to who should get on first, and at worse (during rush hour) people will outright push and shove you to get on the bus. Make sure you hang onto something as soon as you get on, because the bus will start moving as soon as it can. Then, when you want to get off the bus, a few blocks before your stop you push a button on one of the pillars and make your way to the door, all while the bus is still moving. When the bus gets to your stop, the doors open (if not, you have to yell “puerta!” really loud so everyone can hear your gringa accent, because man, that rt combination is hard) and you get off as fast as you can because the bus is going to start moving again as fast as possible. 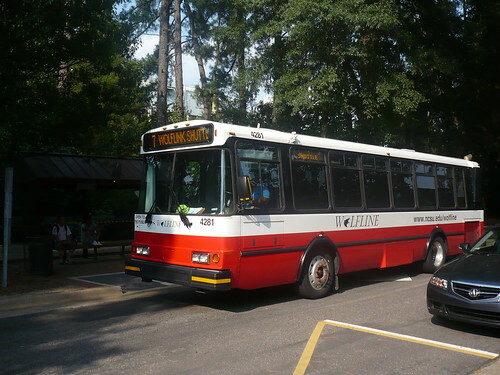 This is the Wolfline bus that serves the NCSU community in Raleigh. Via linademartinez on flickr. You wait at the bus with a bunch of other people and check your phone to see when the bus is coming, because they are all on a GPS system and yes, there’s an ap for that. Or if you’re not so technologically inclined, you can download a schedule and look at it. The bus that goes by my house goes by every 9 minutes pretty much like clock work. When the bus arrives, everyone boards the bus kind of in the order the arrived to the stop. The bus stays stopped until everyone has either found a seat or is holding a handrail. Then, when you want to get off, you pull a cord above your head (if you’re sitting) or push a button on a pillar. However, you do not get up right away. You wait until the bus has come to a stop, then calmly make your way to the door and get off. No rush. The bus driver will wait for you. ETA: I totally forgot to mention this and I can’t believe it. As a lot of people get off the bus, they say thank you to the driver, and the driver usually responds with “Have a nice day” or “You’re welcome.” I only saw this maybe twice during my entire time in Santiago and here it’s standard. I think this maybe has to do not necessarily with U.S. vs. Chile but rather big city vs. small city (that happens to be in the South, where people are really polite). I can’t vouch for this with personal experience, but I imagine that not many people in NYC say “Thank you” when getting off the bus. Nevertheless, it was quite the shock to me the first time I saw it! It took me awhile to get used to these little differences. The first time I rode the bus here in Raleigh, I’m pretty sure the people waiting with me thought I was really rude rushing for the door and not respecting the order of arrival. And it totally wasn’t necessary for me to get up and wait by the door when I wanted to get off. *I’m talking about the Wolfline, I haven’t ridden on the CAT buses yet. We are well into fall here in the southern hemisphere. We’ve had a few days that have been down right cold and had me dreaming of Magaluf holidays. Magaluf, for those of you who don’t know (like me) is a resort town on the Spanish island of Majorca, and let me tell you, as I’m cuddled up here under a fleece blanket wishing I were wearing finger-less gloves: I would love to be vacationing there now! But back to reality. Even though I don’t necessarily believe that temperature causes illness, I have to say that quite stereotypically, I got sick just as the temperatures dropped. Of course all of the Chileans in my life (except for the ones that know me too well) commented about how the changes in temperature were the cause of my sickness. It was the heat in the office, it was because I was riding my bike too much in the cold, it was the warm days and cold nights, and it was because I wasn’t bundling up enough. Abrigar, in Spanish, means to bundle up, and it’s a good word to know, because you’ll hear it a lot in Chile. Chilean mother’s everywhere can be heard telling their children: “Abrigate bien!” or “Bundle up well!” This means wearing a camiseta (thin long-sleeved undershirt), a sweater, scarf and jacket on top, pants or polar lined tights on the bottom and good shoes with warm socks. When I’m home for the weekend, I dress like this because my apartment is cold! (Or I wear a fleece blanket around like a cape, but that’s just me.) However, when I am out and about in the world I have a few problems with this mentality. First of all, my office has central heating. If I dress as described above, I am hot and miserable all day. Second of all, I walk or bike. As someone who believes sickness comes from germs, I avoid the metro as much as possible. It’s a cesspool of germs! So when I walk or bike, I get hot and end up carrying my scarf, jacket and sweater in my arms or putting them in the bike basket. It’s awkward. So, world, that is why I am not abrigada. When I was sick last week, I got chewed out for being desabrigada (unbundled?) many times until I finally started lying and saying I was wearing a camiseta de polar (a polar undershirt) even though I wasn’t, just to get people off my back. Consider this your warning. If you’re in Chile in the winter, make sure you’re abrigada or face the wrath of every Chilean you may meet. Between that and the cold, it will make you wish you were on the next plane to Magaluf.